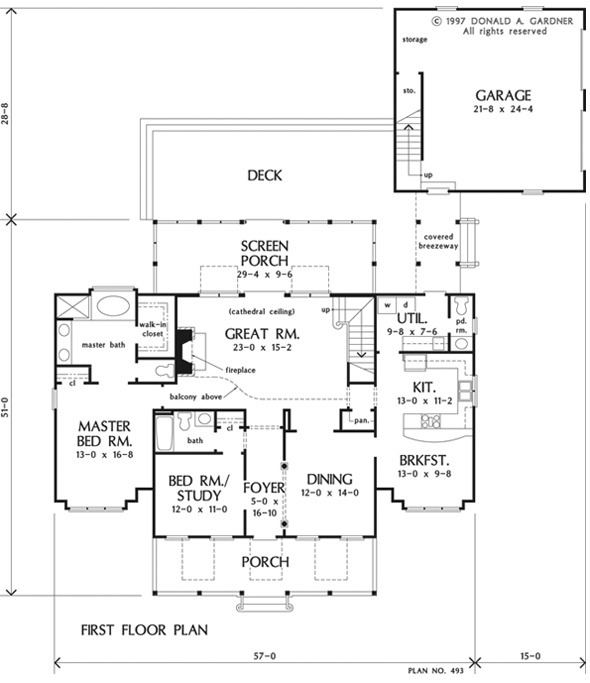 With perfect symmetry, this country home not only has great curb appeal, but a great floor plan as well. With access to the spacious screened porch, the great room boasts a cathedral ceiling and receives abundant natural light from two clerestory dormers. Stairs lead to the second floor balcony which overlooks the great room for added drama. The U-shaped kitchen with nearby walk-in pantry is open to the sunny breakfast area. The master suite is located on the first floor for privacy and includes a roomy bath with separate tub and shower, enclosed toilet, and walk-in closet. The front bedroom is adjacent to a full bath, making it a great guest room/study. Two more bedrooms share a full bath upstairs. 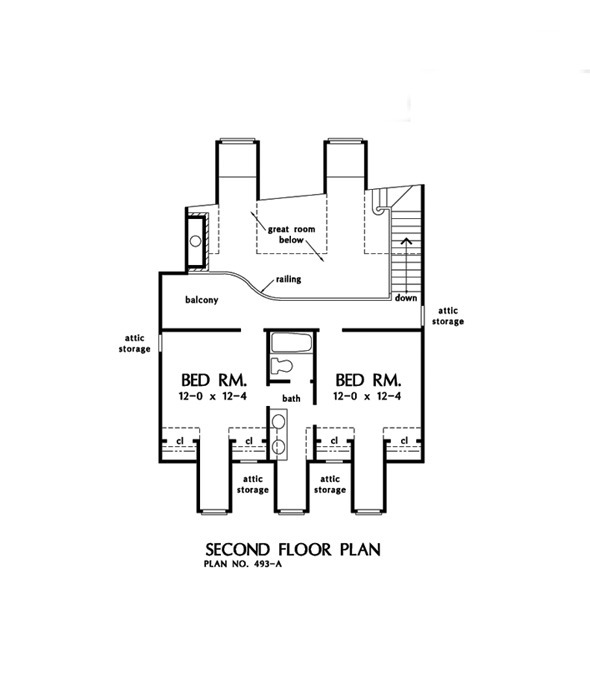 1st Floor: 1776 Sq. Ft. 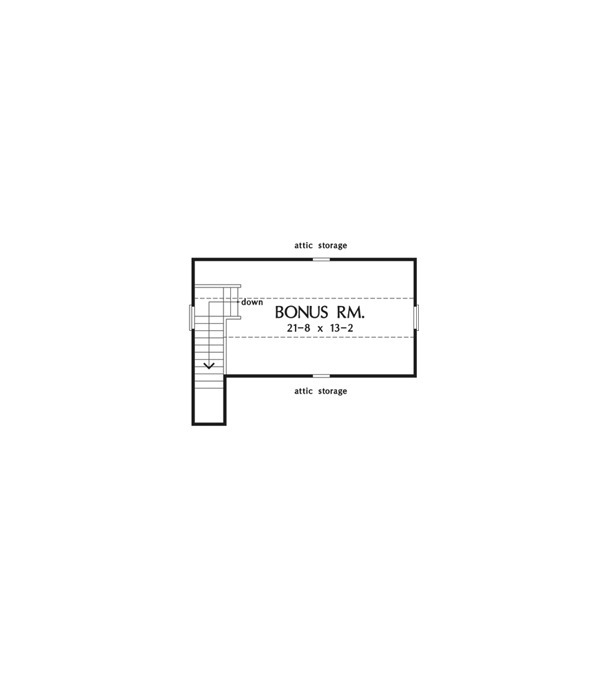 Bonus Room: 382 Sq. 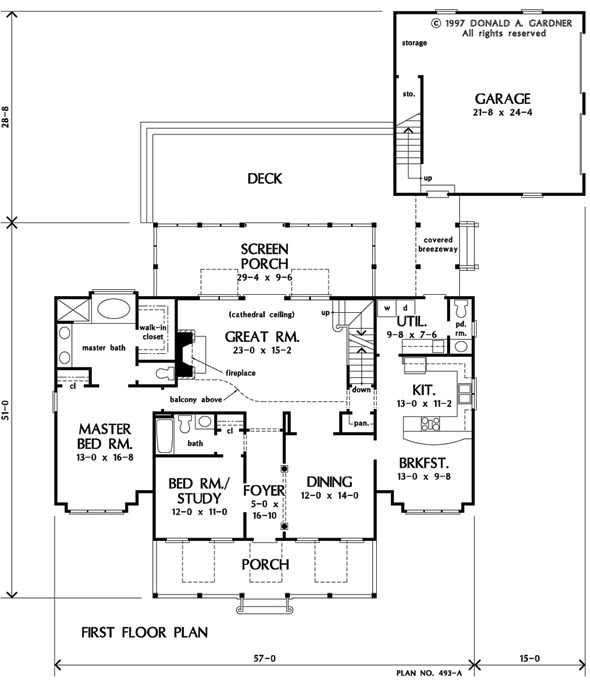 Ft.
House Dimensions: 57' 0" x 51' 0"
Great Room: 23' 0" x 15' 2"
Foyer : 5' 0" x 16' 10" x 9' 0"
Great Room (Cathedral): 23' 0" x 15' 2" x 19' 0"
Kitchen : 13' 0" x 11' 2" x 9' 0"
Breakfast Room : 13' 0" x 9' 8" x 9' 0"
Utility Room : 9' 8" x 7' 6" x 9' 0"
Bonus Room (Vaulted): 21' 8" x 13' 2" x 8' 0"
Garage : 21' 8" x 24' 4" x 0' 0"
Garage Storage : 3' 4" x 10' 0" x 0' 0"
Bedroom #2 : 12' 0" x 12' 4" x 9' 0"
Bedroom #3 : 12' 0" x 12' 4" x 9' 0"
Porch - Front : 30' 4" x 7' 10" x 0' 0"
Porch - Screen : 29' 4" x 9' 6" x 0' 0"
Deck / Patio : 32' 8" x 12' 0" x 0' 0"
Balcony : 29' 8" x 3' 6" x 9' 0"
Storage (Other) : 3' 8" x 8' 4" x 0' 0"
Other : 6' 0" x 13' 8" x 0' 0"